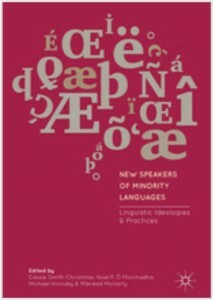 A new book is published today – “New Speakers of Minority Languages” – with chapters on Gaelic by three Soillse research associates. The writers are Nicola Carty, Stuart Dunmore, and Cassie Smith-Christmas. A new book is published today – “New Speakers of Minority Languages” – with chapters on Gaelic by three Soillse research associates. The writers are Nicola Carty, Stuart Dunmore, and Cassie Smith-Christmas. Here’s the link.